Realme, the emerging smartphone brand that specializes in providing high quality smartphones for the youth, today launched its first ever brand film with a new brand slogan, ‘Proud to be Young’ epitomizing the brand and its global positioning. The film that went on air today emotes and evangelizes the brand proposition of Realme- a brand of the young, by the young and for the young. Realme’s first device, Realme 1 was highly praised, earning a 4.4 rating and was the top rated mobile phone in Amazon’s best sellers’ rankings as a new entrant. This was followed by a new iteration, Realme 2, which sold 370,000 units within 10 minutes across two sales on Flipkart. Realme 2 also received 4.5 rating on Flipkart for being the best smartphone popular among the youth. Realme 2 has clocked more than half million units in just 15 days. 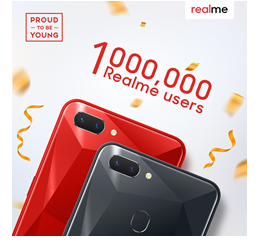 This is a new record and has helped Realme to hit 1mn units as a brand.